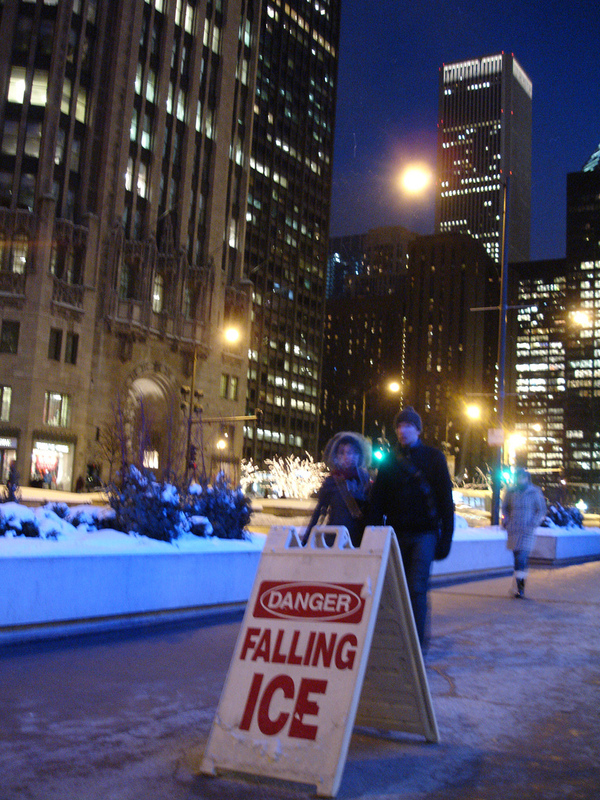 I’ve developed a fear I never had before moving to Chicago and working downtown: ice plummeting 40 stories during a winter thaw and impaling me on my head. Giant skyscrapers and melting snow are a bad combination, and you’re reminded of the pending horror constantly. Signs are everywhere, written in large red letters, “DANGER: FALLING ICE.” No, it doesn’t say “Beware,” or “Watch Out,” or “Caution.” It says “Danger” in all caps. They’re not kidding around. It totally psychs me out. So I pull up my hood, convincing myself that somehow if I’m unlucky enough to walk under that corner of building just as the icicle’s cling to end of the roof gives way, that the thin layer of matted down feathers will cushion the fall. When in reality it will really be my skull that cushions the fall. OK, I’ve lived in Chicago three years and have never actually seen it happen with my own eyes (only read about it). But the snow is extra drippy right now. Maybe I should have moved to Hawaii.